Sharpening video can be a bit trickier than sharpening photos. The process is the same of course… increasing the contrast around edges which creates the perception of sharpness. 1- Noise is more of a problem. 2- Video is frequently compressed more heavily than photos, so compression artifacts can be a serious problem. 3- Oversharpening is a problem with stills or video but can create motion artifacts when the video is played back that can be visually distracting. 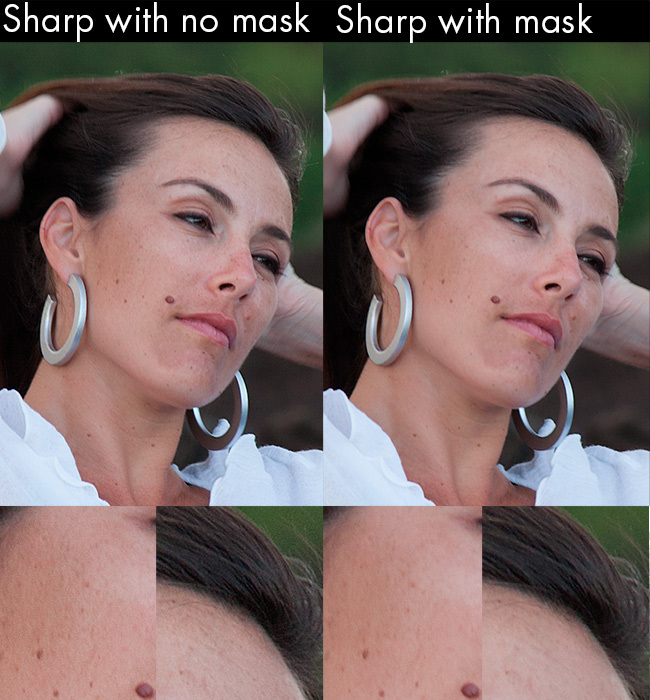 4- It’s more difficult to mask out areas like skin that you don’t want sharpened. These are problems you’ll run into regardless of the sharpening method. However, probably unsurprising, in addition to discussing the solutions using regular tools, we do talk about how our Samurai Sharpen plugin can help with them. Noise is always a problem regardless of whether you’re shooting stills or videos. However, with video the noise changes from frame to frame making it a distraction to the viewer if there’s too much or it’s too pronounced. 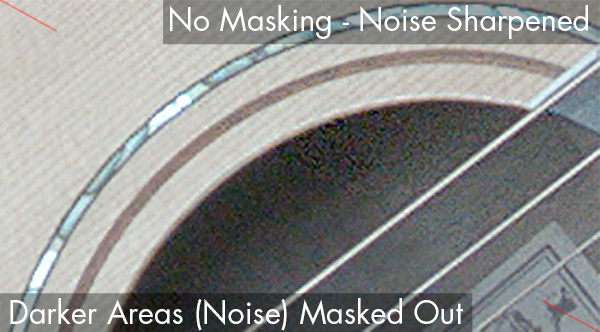 Using a mask to protect the darker areas makes it possible to increase the sharpening for the rest of the video frame. Samurai Sharpen has masks built-in, so it’s easy in that plugin, but you can do this manually in any video editor or compositing program by using keying tools, building a mask and compositing effects. Many consumer video cameras, including GoPros and some drone cameras heavily compress footage. Especially when shooting 4K. It’s difficult, and sometimes impossible to sharpen footage like this. The compression artifacts become very pronounced, since they tend to have edges like normal features. Unlike noise, the artifacts are visible in most areas of the footage, although they tend to be more obvious in areas with lots of detail. In Samurai you can increase the Edge Mask Strength to lessen the impact of sharpening on the artifact (often they’re in low contrast) but depending on how compressed the footage is you may not want to sharpen it. Sharpening is a local contrast adjustment. It’s just looking at significant edges and sharpening those areas. 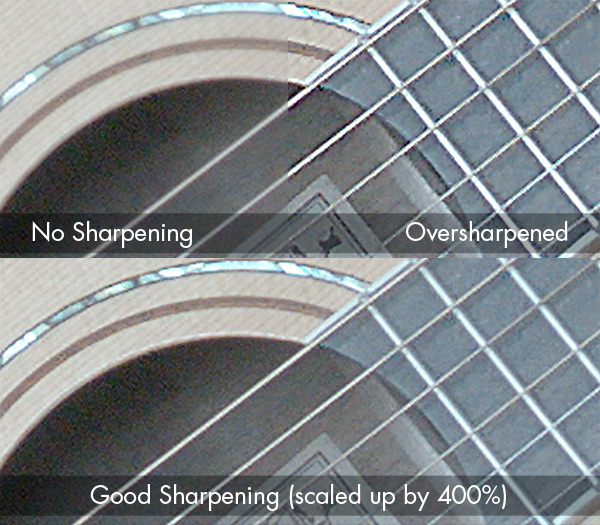 Oversharpening occurs when there’s too much contrast around the edges, resulting in visible halos. Especially if you look at the guitar strings and frets, you’ll see a dark halo on the outside of the strings and the strings themselves are almost white with little detail. Way too much contrast/sharpening. The usual solution is to reduce the sharpening amount. In Samurai Sharpen you can also adjust the strength of the halos independently. 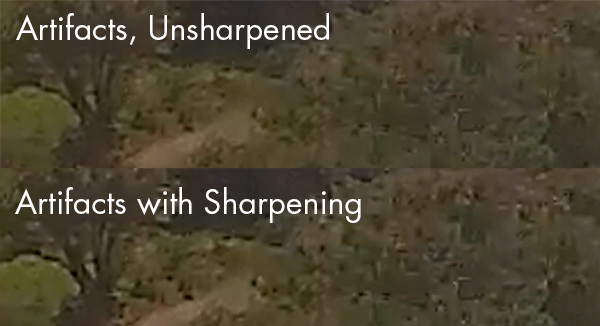 So if the sharpening results in only the dark or light side being oversharpened, you can dial back just that side. Especially with 4K and HD, video is already showing more skin detail than most people want (hence the reason for our Beauty Box Video plugin for digital makeup). If you’re using UnSharp Mask you can use the Threshold parameter, or in Samurai the Edge Mask Strength parameter is a more powerful version of that. Both are good ways of protecting the skin from sharpening. The skin area tends to be fairly flat contrast-wise and the Edge Mask generally does a good job of masking the skin areas out. You can sharpen video and most video footage will benefit from some sharpening. However, there are numerous issues that you run into and hopefully this gives you some idea of what you’re up against whether you’re using Samurai Sharpen for Video or something else.